Unai Emery admitted Arsenal are still a work in progress as they came from behind to clinch a 3-1 victory against West Ham that ended their new manager’s wait for his first Premier League points. They were on the verge of more unwanted history after Marko Arnautovic gave West Ham a surprise lead at the Emirates Stadium. But, while Emery’s team were dismal in defence, they possessed just enough attacking quality to stage a much-needed fightback. Nacho Monreal equalised before half-time and West Ham defender Issa Diop deflected influential substitute Alexandre Lacazette’s shot into the net after the interval. Danny Welbeck came off the bench to wrap up the points in stoppage-time. But Arsenal’s inconsistent performance suggests Emery still has much to work on as the Spaniard aims to restore his new club to the top four after last season’s sixth-place finish. “We are happy with the first three points after two defeats, but it’s clear we need to improve,” said Emery, who dismissed reports he had fallen out with Mesut Ozil after the flu-stricken German missed the match. “It was a difficult match. We need to continue working to not concede many chances. We have to see the reasons why we conceded so many. West Ham’s third successive defeat under new manager Manuel Pellegrini makes it the worst start by a Hammers boss since Avram Grant lost his opening four league games of the 2010-11 season. Pellegrini’s side sit bottom of the table and the Chilean said: “I’m not happy with the result but I’m happy with the performance. “It was what I demanded of the players. We will win more games than we lose if we play like this. Pellegrini’s men snatched the lead with a 25th-minute goal that showed Emery hasn’t erased the defensive woes that ailed Arsenal in last years of Wenger’s reign. When Felipe Anderson took possession in midfield, he was able to advanced unchecked towards the Arsenal penalty area, where he fed a pass into Arnautovic. Aided by the lethargic reaction of Arsenal defenders Shkodran Mustafi and Sokratis Papastathopoulos, Arnautovic had time and space to drill a low drive past Petr Cech from the edge of the area. Jolted into action by that shock setback, Arsenal were level within five minutes. Breaking onto Henrikh Mkhitaryan’s pass down the right flank, Hector Bellerin whipped over a cross that ran through to Monreal at the far post, where the left-back lashed home from close-range to cap a fine 17-pass move. Benefitting from more astonishingly slack defending, Robert Snodgrass should have put West Ham ahead when he ran clear on goal, but the midfielder let Arsenal off the hook with a tame effort. Crucially, Arnautovic squandered two chances to restore West Ham’s lead with sloppy finishes early in the second half. Lacazette’s half-time introduction had revitalised Arsenal and the forward drew a good stop from Lukasz Fabianski with a stinging strike. 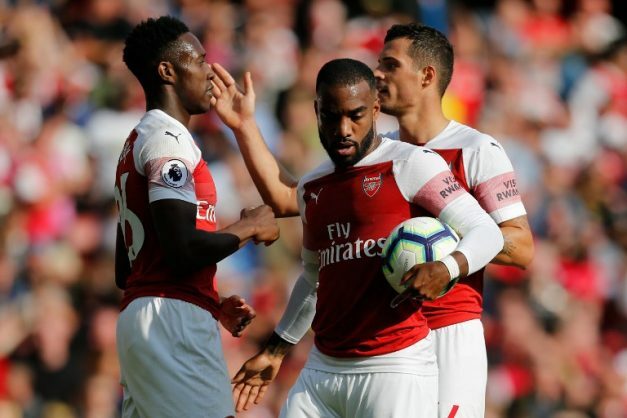 Arsenal’s pressure was rewarded in the 70th minute when Lacazette controlled well on his chest and swivelled for a shot that cannoned off Diop and into his own net. Arsenal finished well on top and Welbeck tapped in from Bellerin’s pass with the Hammers defence in tatters.